An ex-works view of D7667, despite being very near to the end of the production run it still carries the footsteps to nowhere, the boiler room grille and the original location of the exhaust port. However it was delivered new from Derby Locomotive Works equipped with dual brakes. The sixteen year three month career of D7667/25317 was spent allocated to several London Midland Region depots. Dual brake equipped from new. Time between withdrawal & scrapping: 36 months. January 1971 to Birmingham Division (D02). 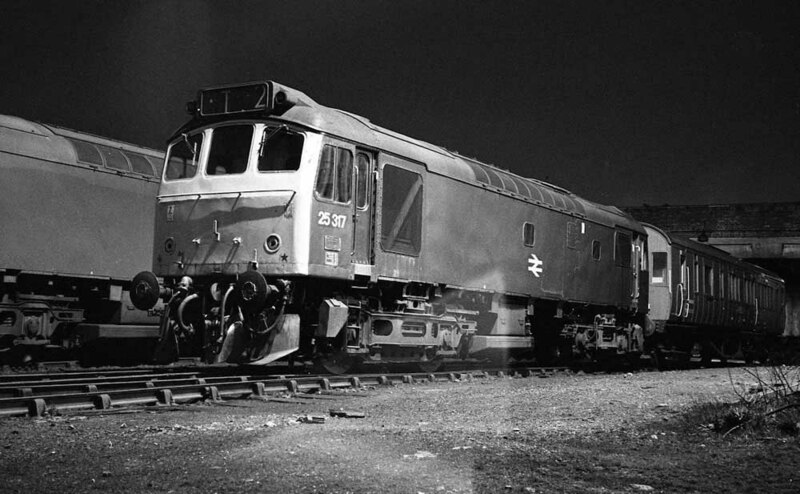 25317 was the 176th Class 25 withdrawn, one of six retired during April 1983. After withdrawal 25317 was stored at Crewe until June 28th 1983 when it moved to Toton, then to Etches Park on July 3rd 1983 and into Derby Works on July 28th 1983. On February 5th 1985 it moved to Swindon as part of a large scrap engine movement, and was scrapped at Swindon by the third week of April 1986. Photograph courtesy Phillip Moore. 25317 stands surrounded by other members of the class at Derby Works on November 26th 1983. Despite having been withdrawn for six months the locomotive looks in reasonable condition for a 'scrapper'. Noted Derby Works October 1970. Noted Derby Works May 1974. 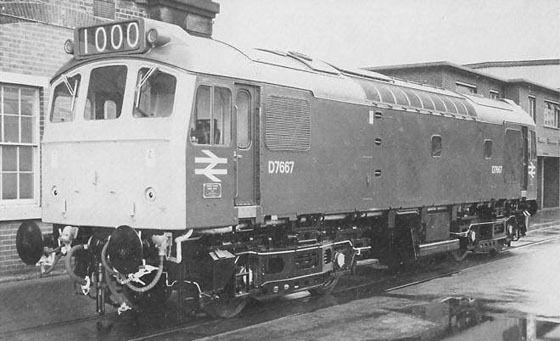 The frames for D7667 were laid down at Derby Works during the autumn of 1966 under order number 11001, with delivery to the London Division (D01) during January - essentially Willesden would be their home depot. 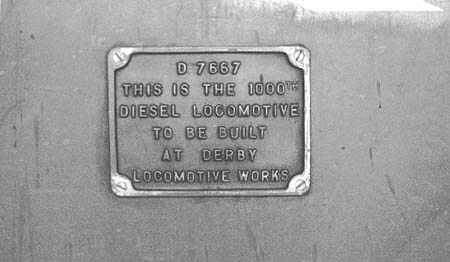 D7667 was the 1,000th diesel locomotive constructed at Derby Works and carried two small plaques in recognition of this fact. This special number would not have been achieved had the original builders allocations been carried out. D7667 was part of a lot successfully bid for by Beyer Peacock, Manchester. However due to their worsening financial situation the last seventeen machines were transferred back to Derby, including D7667. Twelve new Type 2s (D7660 - D7671) were allocated to Willesden to take over the empty coaching stock, parcels and local freight duties in the London area. With the arrival of these locomotives it was possible to release the remaining Class 24s to the Stoke Division, as part of the eradication of steam in the North West. Of this batch of Class 25s D7660 - D7669 were dualbraked from new, whilst D7670 & D7671 were not, however these latter two were quickly transferred to the Nottingham Division (D16). On April 18th an AM10 electric multiple unit became derailed at Milton Maisor near Roade. Several coaches were thrown down the low embankment. 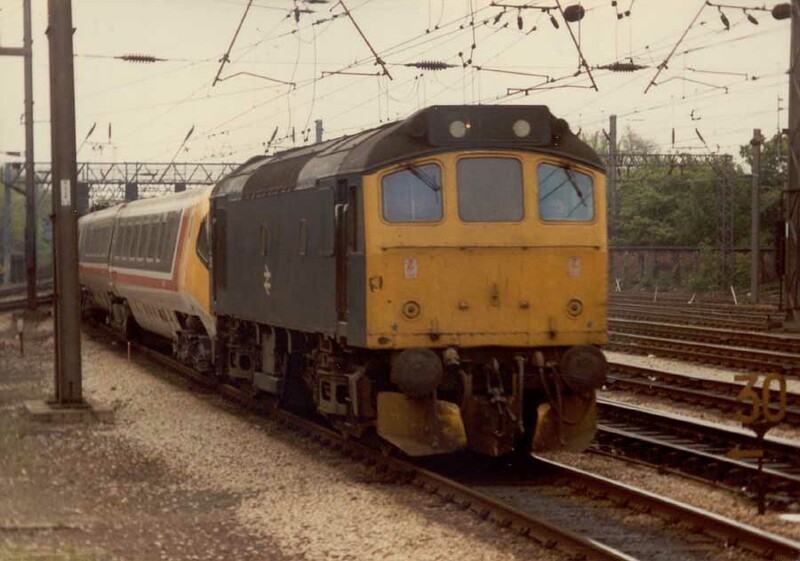 On April 20th three trains were at the scene making good the damage, a Class 40 with a breakdown train and D7667 on a short train of four wagons and two brakevans. On August 18th 7667 worked the 1V33 10.45 Sunday's only Holyhead - Kensington Olympia motorail forward from Willesden, comprised of five passenger coaches and a number of carflats. The derailment of a number of wagons of August 8th's 00.30 Wolverhampton - Ripple Lane at Kings Langley whilst on the up slow line caused quite an operating headache. The wreckage partially fouled the up fast, being run into by the 19.45 Perth - Kensington Motorail hauled by E3129. Although damage to this train was minor a number of coaches were derailed. For the Motorail terminal at Kensington a very busy weekend ensued. With Kensington servicing trains to St Austell, Fishguard and Perth, all in a very short period of time problems could quickly escalate due to the limited loading facilities and the necessity to separate the passenger coaches from the Cartics. Willesden's 7667 & 7669 were on the terminal's shunting duties that night and required some smart workmanship in train marshalling, especially following the delayed arrival of the vehicles from the derailed train. This was not made any easier by the use of this route for a variety of scheduled inter-regional freights and other special movements. Photograph courtesy Tony Sayer. 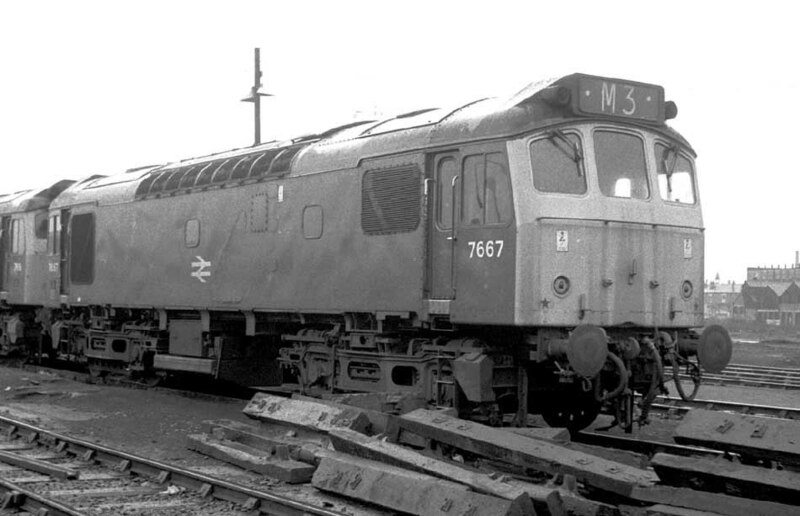 D7667 at Leamington, most likely during the early 1970s when it was allocated to the Birmingham Division. On the south side of London Hither Green was frequently visited by Willesden's Class 25s, the 8M83 14.52 Hither Green - Willesden being regularly used to return the visitors to the LMR, so noted in a short period during October were 7531, 7662/67/69. 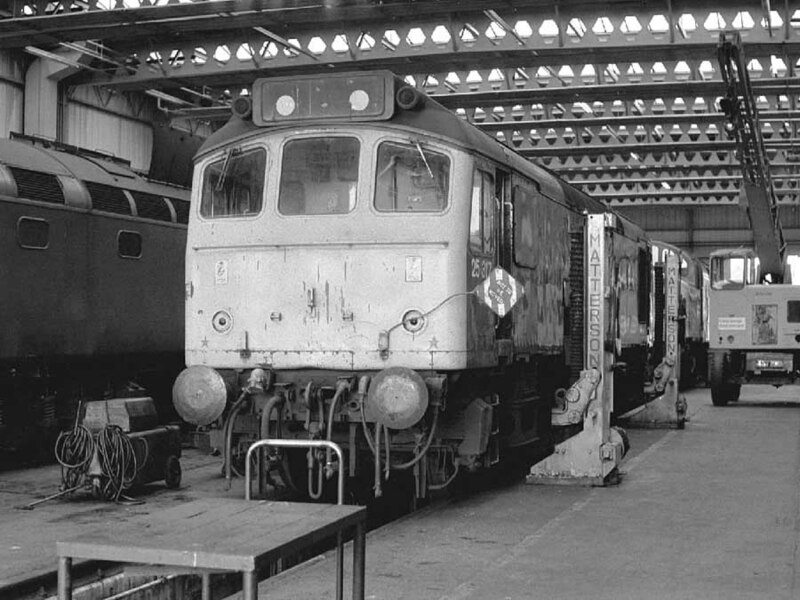 During October 7667 was briefly at Derby Works. Photograph courtesy Tony Sayer. 7667 was one of the few Class 25s to receive blue livery from new. Seen here in the rain at Saltley on April 23rd 1973 the Liverpool Division (D08) had been the home of 7667 since February. 25317 was noted in Derby Works during May. On June 2nd & 12th (?) 25317 & 25202 handled roundtrip Leicester - Skegness passenger workings. Photograph courtesy Tom Sutch. Its sometime in December 1974 as 25317 is lit up by one of the yard lights as it stands in front of the old Springs Branch steam shed. The Teesport - Dalston 'Shell-Mex' oil train was worked by 25317 & 25289 on April 9th. 25317 & 25300 were noted at Polmadie on March 6th. 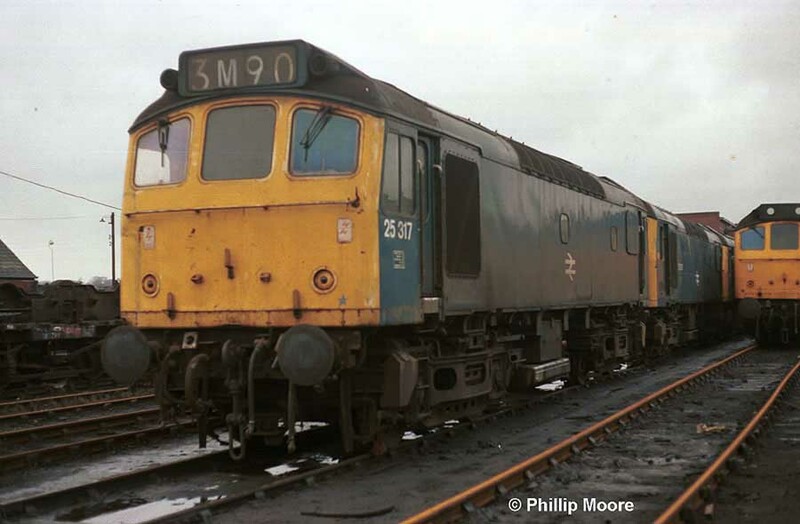 A new contract to move pipes from Leith Docks to several long distance locations including Derby, Wisbech and Salisbury, and shorter hauls to Carlisle, Darlington, Law Junction, Maud & Montrose would provide much work for pairs of Haymarket Class 25s. The Leith - Salisbury diagram involved the Scottish Type 2s working as far as Didcot, examples noted were 25011 & 25026 (March 13th) and 25002 & 25317 (March 27th), 25018 & 25031 (April 10th), 25026 & 25092 (April 24th), the locomotives generally returning north light, at least as far as the Birmingham area. On June 6th a Leicester - Pwllheli day excursion was worked from/to Nottingham by 25317 & ?, a total of 431 passenger miles! On June 26th 25317 worked the 13.33 Taunton - Cardiff, the 17.45 Cardiff - Bristol Temple Meads and the 23.08 Bristol Temple Meads - Cardiff. 25284 & 25317 and two brakevans were noted passing Upton on the afternoon of September 21st headed for Birkenhead. The afternoon Whitemoor - King's Lynn freight was worked by 25317 on November 9th. Gosford Green freightliner terminal commenced a new daily service to Scotland from December 7th, 25317 took out the first service, specially seen off by the Lord Mayor of Coventry. On July 30th an Ealing Broadway - Skegness excursion was worked between Nottingham & Skegness and back by 25317 & 25318. On August 19th 25317 worked the 07.30 Nottingham - Llandudno Town as far as Chester where it was declared a failure and replaced by 25094. Five days later (24th) 25317 worked the 15.32 Manchester Victoria - Bangor and the 19.30 Bangor - Manchester Victoria, followed on August 25th with the same two workings. Three days later (28th) a Longton - Scarborough excursion was worked roundtrip by 25317 & 25060. Whilst working the Mostyn Dock - Amlwch non-ferrous ore train on November 21st, ten hoppers became derailed due to a washout. 25317 remained on the track, the line was cleared by November 23rd when 25317 worked out with an Amlwch - Ellesmere Port freight. During October 25317 was at Derby Works undergoing repair. On October 30th the early morning Redhill - Manchester parcels was noted passing Oxford with 25317. Although 25317 was never allocated to any Scottish Region depots it managed two passenger workings north of the border during 1980. 25317 was stabled at Springs Branch on June 8th receiving attention. On June 15th the 21.25 Dover Western Docks - Stirling was worked forward from Mossend Yard by 25317 & 25244. On June 17th a derailment at Lockerbie saw many WCML services diverted via the former GSW route. The 07.45 Euston - Glasgow arrived at Glasgow at 14.30 in charge of 47227, 25317 & 25296 were promptly attached for the return journey south. On June 24th the 22.00 Stranraer Harbour - Euston required assistance from 25317 between Dunragit & Carlisle after 47541 failed. On July 12th 25317 was in use at Rugby station assisting electrically hauled services in the vicinity of the station due to the power being off. 25317 was noted passing through Bolton with a freight on October 14th. Photograph courtesy Tony Sayer. Surrounded by the 'tools of the trade' 25317 rests at Springs Branch on July 26th 1981. On March 5th 25317 & 25277 worked a Mountsorrel - Barham extra. Photograph courtesy Jerry Glover. 25317 as it heads north through Preston station on May 12th 1982 with one of the APT sets. Towards the end of May (actual date uncertain) 25317 worked a Glasgow Central - Stranraer Harbour service. 25317 was stabled at Birkenhead Mollington Street on August 1st. On August 29th the 23.05 Manchester Piccadilly - Brighton was assisted by 25317 & 25322 between Bletchley & Watford Junction due to the power being off for engineering work. 25317's last transfer came in October, with Crewe becoming its final home. On November 28th 25101 & 25317 were on an engineers turns at Leighton Buzzard. 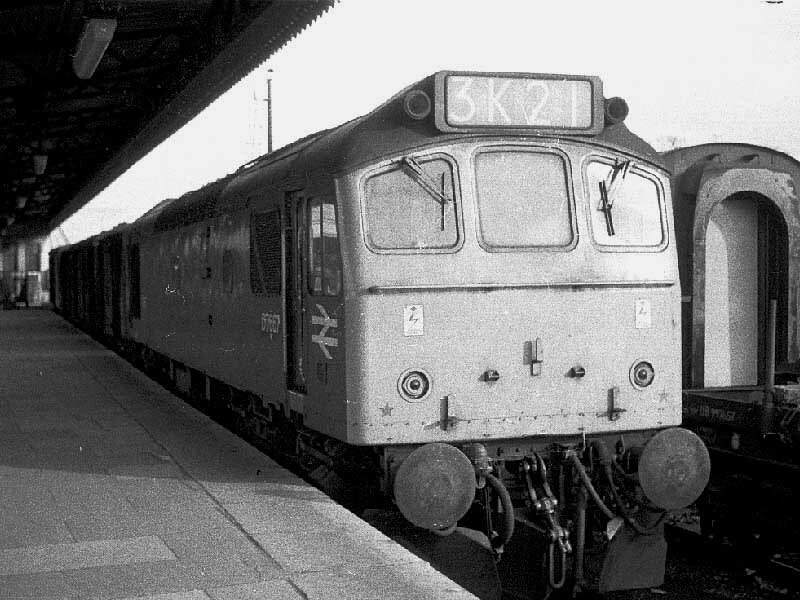 On March 9th 1983 25317 working the 15.02 Manchester - Bristol parcels failed at Wem, Shrewsbury sent out 47197 to assist, the failed Class 25 being dumped at Hereford. Withdrawal for 25317 came on April 25th 1983. At the time of its withdrawal 25317 had run seven years since its last Works overhaul. No.2 cab: 2nd man's side corner, dent with missing paint about halfway up the cab front: October 1981 until withdrawn. No.2 cab: center of cab front: several vertical stains: December 1980 - July 1981 (may have been cleaned off or painted over at some point). No.1 cab: driver's side corner, damage and rust where handrail joins the cabfront: ?? until withdrawn. Page added August 22nd 2001. Last updated April 4th 2019.